Herbicides are a useful aid to help us maintain a beautiful lawn. They need to be used safely and responsibly. The choice to use a herbicide doesn't always have to be a last resort, but if we decide to use them, follow the label completely. We have a choice between organic or chemical products. Organic pesticides are on the rise, but choices are still limited. The term "Organic pesticides" does not mean they are safe. Use the same cautions as with chemical herbicides. When used correctly and according to the label, they can offer a safe and effective means of achieving our goals in weed control. Organic lawn care, for some, may include the use of herbicides while others choose not to. Click on the link if you would like more information to better understand the Effects of Pesticides on the Environment. Weed control products can basically be divided into two catagories: "Contact" and "Systemic". It is important to know which type of product will give you the best results. The word "Contact" means the herbicide kills all parts of the plant it touches. Generally, this is everything above the soil line. For some plants, that is all that is needed to kill them. However, this will not be enough to kill many types of weeds. Plants that can spread by underground stems, roots, tubers, etc. can easily sprout new tissue. Contact herbicides are known best for their "quick kill" effect. Popular advertisements talk of its power to "knockdown in one day". The soft tissue breaks down and shrivels in a matter of hours. As good as it sounds, many weeds come back. For those weeds systemic products are the better choice. Fortunately, some chemical herbicides will contain a mixture of the two, both Contact and Systemic, for better control. The word "Systemic" means the plant absorbs the chemical and transports it internally throughout the plant. It usually doesn't have the quick "knockdown" effect of the contact varieties, but the entire weed will be killed, roots and all. The speed of chemical movement in the plant is largely dependent on soil and air temperature. A chemical sprayed in early spring may take a couple weeks longer to work than the same chemical sprayed in mid-summer. The speed of kill is also dependent on the "mode of action" of the chemical (how the chemical works inside the plant). Always read the label completely before opening the container. Make sure you have all the personal protective equipment (PPE) listed on the label before opening the container. Make sure it is not too windy to spray. If so, wait until weather conditions are right. For complete information on pesticide safety, please read the Using Pesticides Safely page. It is loaded with valuable information to keep you, your family, and the environment safe. Note: The following list is not a complete list of pesticides. Additionally, because they are listed here does not constitute an endorsement. These are simply commonly products labeled for home use. Not all areas of the country are the same. Some products may not be legally used or sold in certain states or may be restricted only to licensed applicators. Be sure to check with your local county extension office if you need help making a selection. You will find the "chemical name" on the list of ingredients. The chemical name never changes and distinguishes one chemical from another. They will be under "active ingredients" on the label. The "trade name" is the name a manufacturer gives a chemical or combination of chemicals that make up a product. Different manufacturers often give chemicals different trade names in a effort to establish a brand. "Post-emergence herbicides" are simply herbicides that are applied after the weeds are growing or have become established. It is important that you choose one that will control the type of weeds you have. This is where weed identification can be helpful. If the weeds you are seeking to control are not listed on the label, then choose a different product. Weeds are either dicots (broadleaf weeds) or monocots (lawn grasses, including grassy weeds). There are also sedges, which are grass-like weeds. There are many genetic similarities between grasses and broadleaf weeds, yet there are also differences. Scientists locate these differences and find a method of attacking that part of the plant. An example would be an essential hormone that is found in dicots, but not found in monocots. By finding a way of blocking the hormone, you can control that weed. If the hormone is found in dicots (broadleaf weeds) and not in monocots (all types of grasses), then the monocots will not be affected. There are fewer chemicals labeled for grassy weeds since turfgrass and grassy weeds are so closely related. For this reason, many grassy weeds still have no selective control methods. "All Vegetation Killers" or non-selective herbicides, do not differentiate between monocots and dicots. Products, such as glyphosate (Round-Up or Rodeo, etc.) control by attacking an element common to both dicots and monocots. However, many brushy weeds (plants with woody stems as opposed to fleshy grass stems) may not be controlled. An additional ingredient is usually needed to penetrate brushy plants. 2,4-D is one of the most widely used broadleaf herbicides in the world. Amine Salt is generally a warm weather formulation, while the Ester formulation is primarily used in cooler weather. Ester is volatile and can damage foliage when used outside its temperature range. When used alone, 2,4-D is strong against a few weeds, but weak against many others. Therefore, it is most effective when combined with other active ingredients. 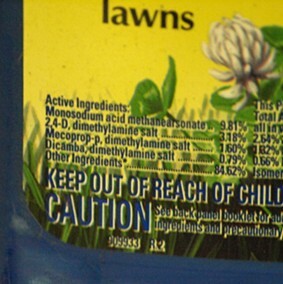 Before purchasing a weed control product, be sure to look on the ingredients portion of the label for a formulations that contains two or more active ingredients. This will give you the best results. A partial list of weeds include: Arrowhead, Dandelions, Henbit, Goldenrod, Lambs-Quarters, Mustard, Plantains, Shepherds Purse, Thistles and others. 2,4-DP is similar to 2,4-D, in structure with varying differences. It is common to see 2,4-DP grouped together with at least one other sister chemical (2,4-D, MCPP and MCPA) for more effective weed control. 2,4-D or 2,4-DP are rarely used as a stand alone product. When they are combined with other chemicals they will control a wider range of annual and perennial broadleaf weeds. Frequently used in “Weed and Feed” products, as well as, liquid formulations. Commonly found in many combination formulations. Rarely used as a stand alone herbicide. Frequently used in “Weed and Feed” products and often combined with 2,4-D, Dicamba, or MCPA. Dicamba is rarely used as a stand alone product. It is almost always combined with other active ingredients. Especially useful in controlling difficult weeds and used in brush control formulations. Commonly found in “triple herbicide” formulations. Dicamba can damage small trees and should not be used in close proximity of non-target shrubs or within the drip line of trees. Black Medic, Chickweed, Clover, Dandelion, Henbit, Knotweed, Mallow, Broadleaf Plantain and others. Often the best formulations will be a two to four herbicide mixture. It not only gives a broader range of weeds controlled, but its effectiveness is increased. Some will have a synergistic effect. Anytime you have to make less applications to control weeds, the better it is for you and the environment. Black Medic, Burdock, Canada Thistle, Chickweed, Clover, Ragweed, Dandelion, Ground Ivy, Lespedeza, Musk Thistle, Oxalis, Poison Ivy, Prostrate Spurge, Virginia Pepperweed, and Wild Violet as well as others. Bindweed, Black Medic, Chickweed, Clover, Dandelion, Dock, Henbit, Knotweed, Mallow, Plantain, and others. Other triple herbicides products may substitute one active ingredient for a different one. 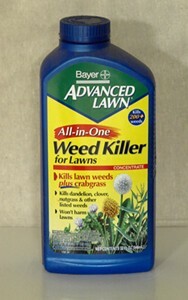 One of the most commonly used post-emergent herbicide for grassy weeds. Similar herbicides from the same family include DSMA. Smooth and Large Crabgrass, Dallasgrass, Sandbur, Goosegrass, Barnyardgrass, Johnsongrass, and Brachiaria. Cocklebur, Puncturevine, Chickweed, Oxalis (yellow Woodsorrel), and Pigweed. Some solutions will combine grassy weed and broadleaf weed ingredients for a single step application. 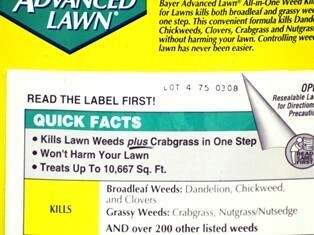 An example is the photo of Bayer Advanced Lawn - Crabgrass and Broadleaf Weed Control. Preemergence (also spelled preemergents) are most often applied with early spring fertilizers. Many different types are available, but not all preemergents work equally well. Some are better for grassy weeds, while others are better for broadleaf weeds. Be sure to read the label carefully to ensure you are getting the right one for you. All preemergents must be applied before the target weed seeds germinate to be effective. Preemergents don’t actually stop the seeds from germinating as is often believed. The seeds will germinate, but the chemical in the preemergents prevent the cells within the germinated seed from dividing. The seedling never develops and uses up all the energy in the embryo. As a result, the seed dies. Remember that most preemergents are active for about 60 to 90 days. Not all preemergents work equally effective against the same types of weeds. Be sure to choose the type that will be most effective against the weeds you want to control. Timing is important because not all seeds will germinate at the same time. When using products with a short active period, seeds that germinate later in the year may get through. Excessive watering or rainfall will stress the preemergent's ability to work correctly and may limit its effectiveness. Do not set your sprinkler to go on every day, but water according to the grass’ needs. Dithiopyr under the trade name “Dimension”. Dimension is great against crabgrass and foxtails and many other weeds. It is the only product that has a slight post-emergent killing effect of young seedlings. When timed right, it can give season long control with one application. Prodiamine under the trade name “Barricade”. Barricade can go a little down earlier that most other preemergents. It also gives season long control with a single application when timed correctly. Note: Dimension and Barricade are the only two preemergents that give season long control with a single application. Has only a moderate active period, so timing is important. After about 60 to 90 days after application it is no longer effective. You may find that late season crabgrass weeds might still get through. Benefin + Trifluralin under the trade name “Team”. Team is both a grass preemergent (benefin) and a broadleaf preemergent (trifluralin). Make sure you check the label for the type of weeds it prevents. It must go down before the seeds germinate to be effective. Isoxaben is primarily a broadleaf preemergent. It does an excellent job and performs better that most “grass” preemergents in preventing broadleafs weeds from germinating. The combination of the two ingredients broadens the spectrum of the herbicide. Not all herbicides are the same. Organic herbicides are becoming more popular, but the choices are still limited. Find out what products are popular and how they work. We all need to be aware of our environment. If you would like some helpful information on how pesticides can effect the environment, click on the link above. Spray Adjuvants are added to herbicides to increase their safety and effectiveness. Find out how adding a sticker and spreader to your herbicide can help it to work better while using less product. If you have a zoysia grass lawn, you know how beautiful and hardy it is. However, 2,4-D herbicide can harm it during a short period in spring. Click here to learn about weed control for zoysia lawns.